I said I'd be back with a weekend recap today, but since the Twins essentially got the weekend off (not playing either Saturday or Sunday) I've decided to take the day off as well. Plus, I'm kinda lazy like that :). One interesting tidbit of news did emerge over the weekend, however: the Twins and Hennepin County came to an agreement on a stadium deal, which will be officially announced this afternoon. Now before you get too excited, just remember that we've gotten to this step like a half dozen times before, and funny, we're still playing in the big concrete bowl downtown. With that being said, I'm actually fairly optimistic about this latest plan. The sales tax is miniscule (you'd be hard-pressed to complain about $.03 on every $20, or about $30 extra on a brand-new car), Smilin' Carl has decided to pony up his dough with no strings attached, the site is absolutely perfect (especially from a logistics point of view), and there is absolutely NO state money required for anything. I would hope that the state would consider the $100 million investment in the roof a worthwhile thing, but if they don't, that's their perogative. All in all, it just seems too damn good to be true, so there is naturally no way it will actually be approved by the Legislature before they run out of time this session. Our state legistlature takes for frickin' EVER to do ANYTHING (even by legislative standards) and they've got about eight gazillion things to get done in the next month. I desperately hope they do get it done (I'm someone who went in on season tickets 8 years ago in hopes of getting priority at the new digs) but I can't be anything more than cautiously optimistic at this point. Shane from Greet Machine, our resident stadium expert among Twins bloggers, actually expresses many of these same sentiments in his entry for today, which I encourage you all to read for more in-depth analysis. The Twins Chatter early betting line on this stadium plan actually going through? 4-1 (against). Any takers? Yesterday's extra-inning 10-9 win over the Royals was filled with so many notable occurances that I felt could not go un-commented upon here at TC, so I'm going to break my week-long string of (relative) silence and put up an original post today - bullet point style. The bubble finally burst for Dave Gassner, as he was absolutely pounded by the previously-punchless Royals yesterday afternoon, allowing five runs (four earned) in just an inning and two-thirds. I had very much hoped it was the real Gassner that shut down the Indians last Saturday, but I fear the one who showed up today is closer to reality. When you don't have much velocity as a pitcher, you're margin for error is just that much smaller. Gassner throws everything but gas, and it hurt him Thursday when his control wasn't impeccible. Lew Ford seems to be back on track after an auspicious start to the season. He went 4-6 yesterday (and is now 7 for his last 12) and drove in the game-winnnig run with a bases-loaded (imagine that) RBI single in the 10th. 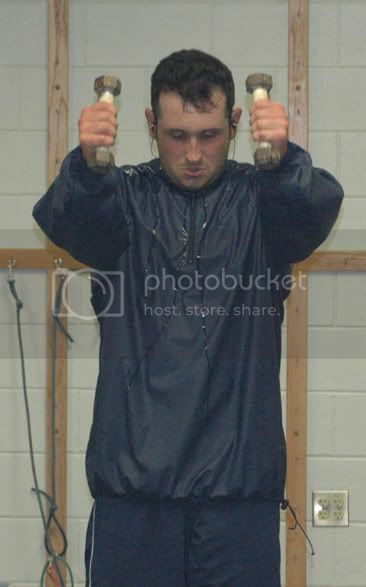 Jim Souhan wrote a nice little piece about TC's official player today, as it appears he may have made the necessary adjustments after suffering through a slow spring and first three weeks. Was anyone else out there a bit surprised at how Gardenhire managed his catching situation at the end of the game yesterday? 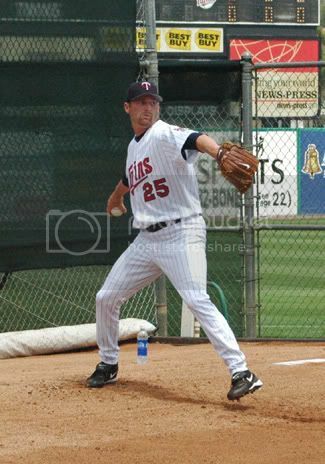 Mike Redmond, playing for the first time in week after Mauer had caught three straight games, had to leave the game in the eigth after a collision. Corky "Corky" Miller (sorry, couldn't resist that one) replaced him defensively, but interestingly enough, Gardy pinch-hit Mauer for Miller in the 9th inning with the winning run on third. Now I completely agree with Gardy's decision to use Mauer in that situation (even though he was intentionally walked), but I just find it a bit interesting that he would do it in an extra-inning affair. The game could have easily gone on a quite a bit longer, with Joe catching an extended amount for an unprecedented (this season at least) fourth consecutive day. Any thoughts? Tonight's game against the Tigers marks the return of one Carlos "The Jackal" Silva, who is back after a bizarre (and as it turns out, unnecessary) trip to the disabled list. The improbable return of Silva and the reemergence of Joe Mays really brings home exactly why the Twins remain the team to beat in the Central this season: they have pitching, and lots of it. Justin Morneau also returns to the lineup tonight, and he will hopefully provide some needed production in what has been a very inconsistent offensive unit thus far. It also means the defensive circus that is Matthew LeCroy gets to ride the pine for a while, which is never a bad thing. There ya have it folks - plenty of storylines to follow this weekend. It should be an entertaining series to watch, as the Tigers get another chance to prove that they are legitimate contenders this season. Tune back in on Monday as I'll be back with a weekend recap of the series. Until then, have a great weekend everybody. 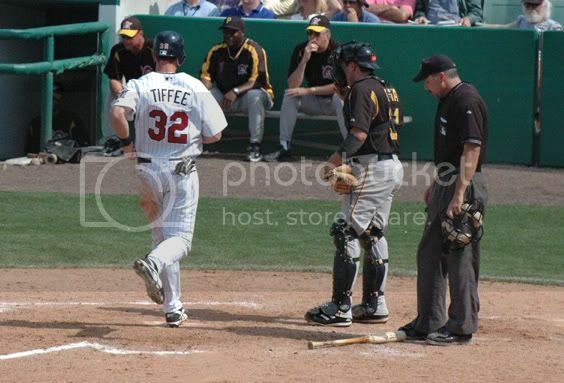 Mike Redmond and Mike Sweeney collide at home plate during the 9th inning of yesterday's game. Sweeney was safe on the play and Redmond was forced to leave the game. The Twins suffered yet another disappointing loss at the hands of those accursed ChiSox today (I don't know about you, but they are REALLY starting to get on my nerves about right now). Unfortunately, I wasn't able to catch any of the game and therefore don't really feel qualified to write anything intelligent about it. Plus, I'm incredibly sleep-deprived... lots going on here at St. Olaf! In lieu of a new post today, I'm going to reprint (for your reading pleasure) a season predictions article I wrote for our school newspaper last week. It's not the most in-depth piece every, but if you just so happened to be curious about who I'm picking for the playoffs this year, well, here you go! If you're interested in who some other Twins bloggers are picking, click here. One of the most enjoyable things about the game of baseball is that it lends itself to prognostication extremely well. Each new season brings with it a flurry of predictions found in every sports page, magazine, radio show and weblog around the country. As a self-professed baseball junkie, I am always asked, “Who’s your pick for the World Series this year?” I usually put off answering such questions, knowing that any predictions I give will almost assuredly look like pure folly six months from when they’re made. American League East: Before the Toronto Blue Jays’ surprising crash to last place in 2004, the order of finish in this division had remained unchanged for six consecutive seasons: New York, Boston, Toronto, Baltimore and Tampa Bay. Unless you are the Yankees or the Red Sox, the most you can hope for in the East is a third-place finish, and I that pattern will hold true once again this year. The Sox may have vanquished the Curse last fall, but the Randy Johnson-led Yankees have been constructed to win over the long haul. American League Central: The Central has traditionally been one of the weakest divisions in baseball from top to bottom, as over half its teams routinely finish with losing records. That should change this season, as Chicago, Cleveland and Detroit all believe they can challenge the three-time division champion Minnesota Twins. The White Sox, Indians and Tigers all boast impressive lineups, but the Twins’ pitching staff (led by AL Cy Young Award winner Johan Santana) is simply too good and too deep to be overcome. American League West: All four teams in this division could conceivably finish with winning records, given the dramatic off-season improvements made by last year’s cellar dwellers, the Seattle Mariners. The Texas Rangers, a surprise contender a year ago, will be doomed by their lack of pitching once again this season. If anyone is poised for a significant drop-off, it’s the Oakland Athletics, who will feature a starting rotation with three players under the age of 25. In the end, the well-balanced and newly re-christened Los Angeles Angels of Anaheim (the name change being a thinly-veiled attempt to increase revenues) will most likely make the playoffs. National League East: The East should be one of the most competitive divisions in 2005, as three teams (Atlanta, Florida and the New York Mets) all appear to have a legitimate chance to win. However, as their early 1-6 start indicates, I believe the perennially-underachieving Mets will do so once again this season, despite the offseason additions of Carlos Beltran and Pedro Martinez. This division will be a dogfight between the Braves and Marlins, with the loser most likely ending up as the NL Wild Card. National League Central: The mantra in this division has always been “If the Cubs are healthy, they could …” Well, the Cubs (mostly notably starting pitchers Mark Prior and Kerry Wood) were not healthy in 2004, and the preliminary outlook for 2005 isn’t too rosy either. The St. Louis Cardinals, NL Champions a year ago, are back and ready to make up for their four-game collapse in last year’s World Series. The Houston Astros received a nice boost with the return of seven-time Cy Young winner Roger Clemens but will miss the departed Beltran. It’s in the cards for the Cards again this season, as they will win over 100 games and take the division crown. National League West: While there appear to be clear-cut favorites in just about every division in baseball this season, the NL West is definitely the exception to that rule. With artificially-enhanced über-player Barry Bonds on the shelf for an indefinite amount of time, the San Francisco Giants could fall in the standings. The Dodgers made a number of interesting (some would say foolhardy) personnel decisions this past winter, and I would be surprised if they repeated as division champs in 2005. Instead, it will be the underdog San Diego Padres that make the playoffs for the first time since 1998, beating out an improved Arizona Diamondbacks team. Even in this era of beefed-up sluggers and inflated offensive numbers, the key to success in the big leagues still comes back to one thing: pitching. It is for this reason I think the Twins will shock New Yorkers when they top the Yankees in the AL Division Series in October. I also believe the Red Sox will see their luck run out as they are beaten in the ALDS by the Angels. In the National League, the Marlins and their outstanding staff will move past the Padres in round one while the Cardinals will defeat the Braves in the other series. In the American League Championship Series, the Angels will emerge victorious from their 2002 ALCS rematch with the Twins, while the Marlins will surprise and win the National League Pennant over the Cardinals. Your 2005 World Series Champion? For the second time in three years (remember 2003’s improbable upset of the Yankees? ), it will be none other than the Fightin’ Fish themselves, the Florida Marlins. I'm extremely sorry to disappoint all of you today, but sometimes life gets in the way of blogging. Today (unfortuately) was just one of those days, so I won't be able to post anything new. I'm usually pretty good about updating on Mondays (it's one of our bigger days) but I just don't have it in me today. For some excellent Twins analysis, I suggest you check out the links on the left side of this page. On a positive note (for me, anyway) I recently found out about a couple of baseball trips that I'll be going on in the next month and a half or so! I'm going to Boston and New York at the end of May to catch a Red Sox-Atlanta game AND (amazingly enough) a Red Sox-Yankees game at Yankee Stadium. Plus, I'll be making the drive down to Omaha for the 2005 College World Series, which is one of my favorite baseball events. So even though TC might not have anything new today, rest assured, I am not sitting on my laurels! Have a great Monday everyone and we'll see you here tomorrow. 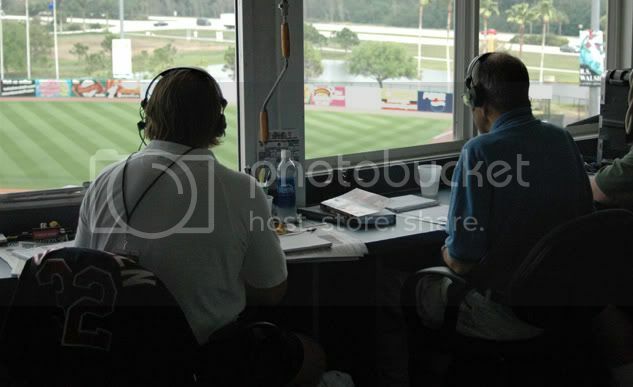 In all the hullabaloo over yesterday's impressive 10-4 win over the Tigers, many of you (and by "many" I mean "everyone except me") may have forgotten that today, April 15 2005, actually marks the one-year anniversary of Twins Chatter! That's right: one year ago "Your source for insightful, thoughtful, and somewhat opinionated Minnesota Twins coverage" officially went public (although a little premature linking from Seth put a little scare into me!). Now one year may not seem like much to any of you, but in the blogging world it actually a notable accomplishment. Blogs are not enterprises that typically inspire longevity; they are "easy come, easy go" endeavors, usually sputtering out within the first few months of existence. While it would be a lie to say that we haven't endured our fair share of bumps in the road, Twins Chatter is still here (and you're still reading this!) so we must be doing at least something right! We've had over 26,600 people visit in the past year (for a modest average of 73/day). We've also had almost 31,000 "hits" or page views (for a more respectable average of 85/day). We've posted on 214 separate occasions. Twins Chatter was highlighted in the extensive Star Tribune piece (sorry, the links are all expired now) about Twins blogs that ran back in early October. 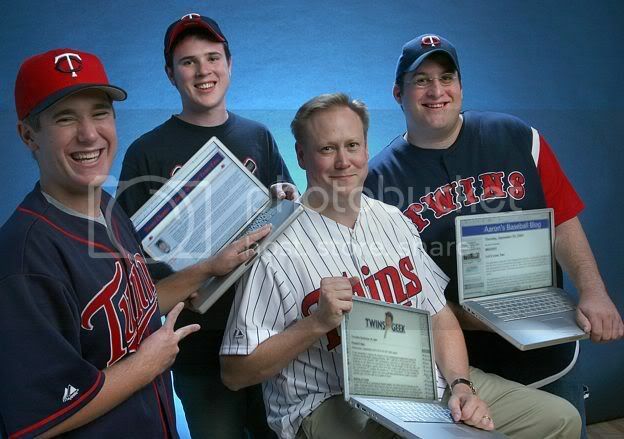 This photo (I'm the one on the far left) was actually on the front page of the Strib's Variety section on October 5. And I would be remiss if I didn't mention the fact that we've been doing some decent writing over the past 12 months. 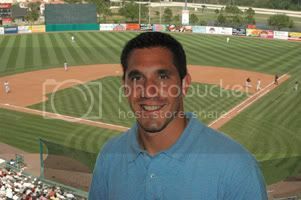 Posts about Blanco's HOF career, Victory Sports, the 2004 draft, Dougie's departure, the ALDS loss, The Battle for the Ring, reelections, spring training, and this interview were some of my favorite posts, and I'm sure John will point out some of his favorites sometime soon as well. It's been a year of ups and downs for Twins Chatter. We never quite made it into the mainstream Twins-blogging scene (i.e. Twins Geek, AG, and Batgirl status) but I have pretty much accepted that fact and am content with the little corner of cyberspace that we've carved out over the past year. I never quite got around to designing a fresh new look for the site, although we do have our very own logo now (which I am very pleased with). And we've struggled with bouts of inconsistency at times, such as taking almost the entire month of January off as well as two weeks in March. However, I believe that the writing you'll find at this site today is much-improved over what was here 12 months ago, and in the end, that's all that really matters. Twins Chatter was here before the more recent influx of Twins blogs (many of which were started last fall or this spring) came into being, and I think we'll still be here when they are gone. I'm going to keep plugging away, and John will continue to support me as best he can. In closing, I just want to thank you all for your continued patronage and I hope you feel it's worth the time you spend at this site every day. As always, feel free to post any comments you may have below and I'll do my best to respond to them. This was an eventful weekend in Twins Territory (I don't know about you, but I like that phrase much better than my previously-coined Twinsland), probably the most eventful weekend of the year thus far. And nothing shall go un-commented upon here at TC. Although the Twins lost 2 of 3 to their arch-rivals from the South Side, Carlos Silva's potentially season-ending injury was the story of the weekend. It sorta blindsided everyone, including those people in the organization, especially given how well he pitched last Wednesday. I will go on the record with this right now: I do not think that Joe Mays will be an adequate replacement for The Jackal. I may have been able to live with either Kyle Lohse or Joe Mays stinking it up every five days, but both? I'm not so sure about that. I almost guarentee that Mays will struggle initially (which is at least somewhat understandable, given the fact that he hasn't started a game since Aug. 29, 2003) but I will still be surprised if he regains his long-lost effectiveness this year at all. Mays was hit pretty hard towards the end of spring training and in his only appearance of the season on Friday. And as Aaron Gleeman states today, Dave Gassner isn't the answer to our problems either. He's a soft throwing lefty who might fool some bad teams (hopefully) but probably isn't going to be mowing down quality major leaguers anytime soon. 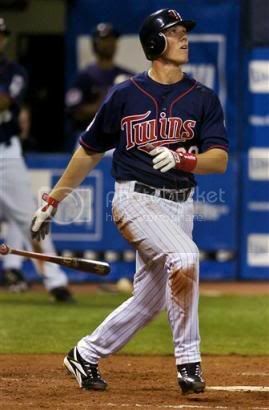 Justin Morneau's extended absence also has me worried about the state of the Twins. Originally it was thought that he would be out only a day or two, but now the timetable is very uncertain. He'll see a specialist today, and it is sounding more and more like there might be something pretty serious wrong. The new-look Go-Go Sox impressed me this weekend in taking two of three. The Twins did not play particularly well either Friday or Saturday, but the ChiSox deserve a lot of credit for putting both of those games away with some timely hits and timely thrown double play balls. The Sox were dismissed by much of the media this past winter, predicted to finish as low as fourth in many preseason predictions, but I wouldn't be surprised if they stick around for quite a while this year after seeing them play firsthand. The Twins defense has been a little disappointing through six games. We all knew it probably would suffer with the departures of Dougie, Koskie, and Guzman, and that indeed seems to be the case. Cuddyer can be absolutely infuriating at third sometimes, making a spectacular play in the hole but then botching a routine grounder or throw. 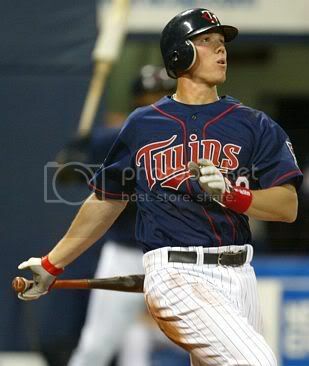 And LeCroy makes Morneau look like Dougie Baseball himself over at first - that's how bad he looks. He misplayed a couple of balls early in the game Sunday that could have made things dicey for Johan. I seriously can't wait until we get him off the field and into the dugout where he belongs. Rivas also had a mental gaffe last night, failing to cover second in time on a steal attempt. I believe Corky Miller would have had his first highlight as a Twin if Louie had not been so slow (the runner probably would have been out). "Sweet" Lew, the Official Player of this Blog, has had a rough start to the season. He's got just four singles so far this season (at least two of them infield singles) and I have yet to see him hit the ball with authority. Has the bubble burst for everyone's favorite computer geek? I sure hope not, but Lew's going to have to make some adjustments relatively soon if he hopes to stay in the lineup on an everyday basis. That's all I've got for you today. If you disagree/agree/don't care about what I said today, feel free to express that inner voice in the comments section below. I (or possibly even John!) will be back with more Twins Chatter tomorrow. 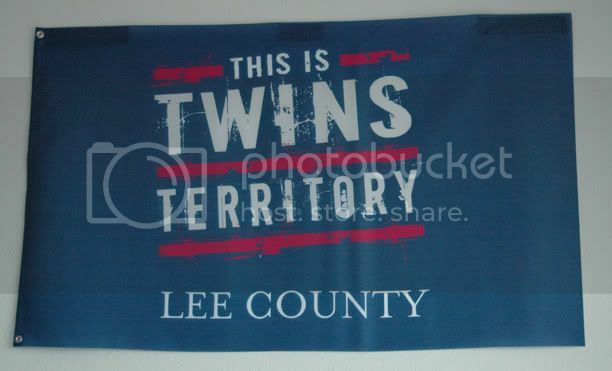 For the first 4 innings of last night’s game it appeared the Twins were in for a tough year. Forget all the big predictions going into this season, in the first game and half of the year the team had shown that it couldn’t hit or pitch up to expectations. When Johan Santana gives up 4 runs to start a game something appears to have gone horribly wrong. All it took was ½ of an inning for everything to be as it should be. Suddenly the team was making plays in the field, their CY Young was back to his old self, everyone in the lineup had a hit and all that was left was for a bullpen full of power arms to finish it off. Anytime Johan Santana starts he is story of the game. He didn’t have his best stuff last night and had to rely on his changeup even more than usual. The best pitchers in the game are able to overcome bad innings and Santana was marvelous. 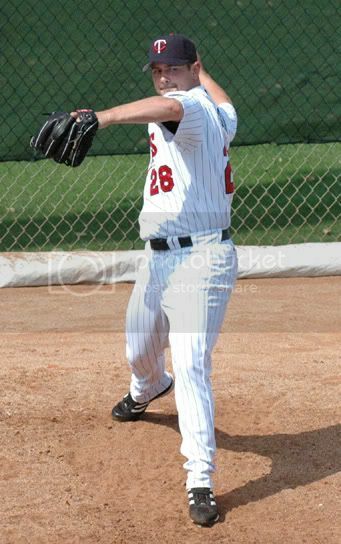 He didn’t allow a run in his last 4 innings while finishing with 6 K’s and the win. He kept his team in the game so they had a chance to come back. The lineup finally showed what it was capable of. This lineup should be better then last year with no easy out 1-8 in the order. Joe Mauer, Justin Morneau and Torii Hunter have a chance to be an especially potent combo. We haven’t seen the power potential yet but this team is going to need to generate a lot of runs anyway. To many, Jacque Jones is an enigma and last night he did a little to prove that both true and false. He showed what frustrates people when he swung at the first pitch and hit into a double play early in the game. His homerun to end the 5th inning scoring was really a thing of beauty and gives hope of the kind of season he is capable of. The Twins look like they are going to be just fine with a rookie at short. It is hard to remember his brief stint with the team last year because he did nothing special. Now he looks like a hitter at the plate and showed he is able to come up big when needed. He isn’t going to be Cristian Guzman right away but he is showing the Twins weren’t crazy to let Guzman go this winter. Speaking of infielders, even Luis Rivas didn’t look too bad at the plate last night, hear is hoping he proves Gardenhire and me right. The Twins were able to showcase much of their bullpen with Santana’s early high pitch count. For the most part they looked pretty good. There was a scary moment when Jesse Crain hit Brett Boone but JC Romero was able to come in and pitch effectively, always a good sign with him. Juan Rincon showed no ill effects carried over from game four of the ALDS and threw some pretty nasty stuff. Joe Nathan ended the game like he is supposed to. With the excitement of the early season it is easy to lose sight of the old cliché that it is a marathon, not a sprint. Games are played for 9 innings and often times the difference between an out and a rally is less than an inch. The Twins are a team built for success. Brad Radke and Santana can have bad outings and Joe Mauer can strike out 3 times and the beauty of the sport is they all can bounce back the next time out. This is the first of many wins in what promises to be an exciting year of baseball. I don't have a lot of time to write tonight (damn you, 8 a.m. classes!) 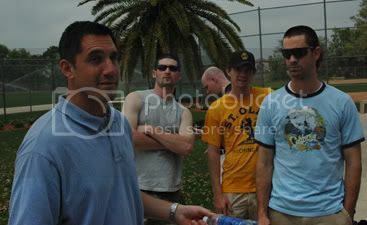 but I thought that I would briefly share a few thoughts with all of you about yesterday's game, the first of 162 here in 2005. I was able to take time out of my busy schedule and caught every single pitch on TV (I wouldn't miss it for anything), so I'm coming from a position of familiarity here. Brad Radke wasn't perfect by any means, but he did put together a pretty solid outing overall. The two mistakes that hurt him the most (the two home runs) came on fastballs that he simply left up in the zone. I had a sinking feeling that Brad might be somewhat flustered after his mental gaffe in the first, and sure enough, he grooved the very next pitch to Sexson. Sexson's third-inning homerun came on a pitch that only he could hit out: just a little bit above the knees and out over the outside corner. Not a terrible pitch, but that's the reason the M's gave this guy $50 million this winter. 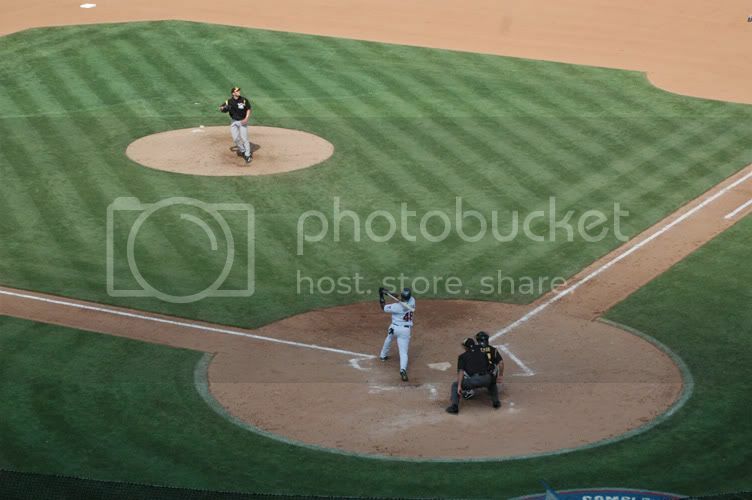 The M and M boys didn't look stellar at the plate against the crafty lefty Moyer, as I thought might happen. Joe didn't hit the ball that well all day, and Morneau looked pukey in just about every at-bat (save his lineout to right late in the game). That's the risk you run with two young left-handed hitters batting back-to-back: the occasional off-day. I think both these guys will fare much better tomorrow against Gil Meche. How about that throw by Mauer to nail Ichiro stealing? 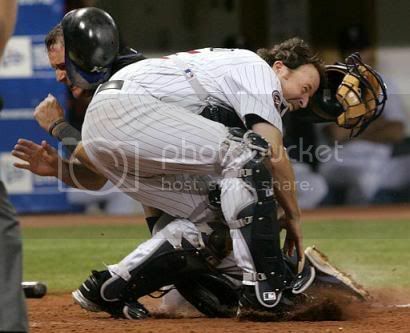 Even though Ichiro was probably safe, it was still a helluva play by Joe. There aren't very many other catchers out there that can scoop a tough pitch out of the dirt and still throw out one of the fastest runners in the game. Now I remember why we like this guy as a catcher so much :). Jacque Jones and Luis Rivas, two much-maligned Twins this offseason, turned in a number of excellent defensive plays yesterday afternooon. Hopefully we'll see that excellence transter to the plate in the near future (although Rivas did have a single in yesterday's game). 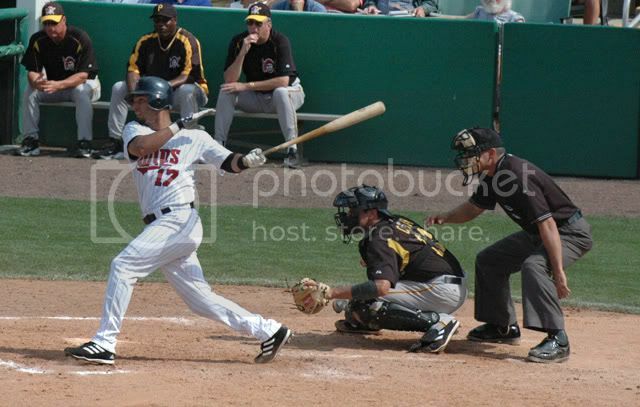 Jason Bartlett looked very comfortable at the plate, a 100% improvement from his brief stint last summer. If he can cut it defensively (he wasn't tested at all Monday) this kid might just make it. Despite suffering their first Opening Day loss since 2000, Monday's 5-1 loss wasn't a wasted effort by any means. Bradke pitched decently and the defense looked solid, and the Twins hit the ball hard a few times (with little to show for it). Johan K. Santana is in a good position to enact a little revenge tonight, and I think he is chomping at the bit to do so. Be sure and tune in to FSN at 9:00 p.m. CT tonight. Tomorrow, Twins Chatter readers, should see the triumphant return of my long-absent partner John. Be ready to welcome him with open arms, as his presesce has been missed in the ever-expanding Twins blogosphere. Also, I have a nice little feature interview planned for later this week, so keep your eyes peeled for that as well. All I can say is this: It's about time. We have been waiting for this day for almost six months. We've been waiting since Ron Gardenhire made that infamous non-move back in Game Two. Ever since Ruben Sierra launched that three-run homer off Juan Rincon in the eighth inning on October 9. Ever since Pat Borders so ignominiously ended his 16-year career with that most inexecusable of all baseball blunders: the passed ball. We have been waiting for this day for 177 long, dark, and cold days. We've seen dead weight shed (Guzman). We've seen dead weight retained (Rivas). We bemoaned the exodus of a true Canadian folk hero (Koskie). Yet at the same time, we cheered as two key pieces stayed home, preserving hope for the future (Radke and Santana). For 4,248 hours we have been awaiting the official return of our hometown nine. The foul stench of scandal emerged, doing all it could to dampen our excitement. We saw the return of the free-spending days of yesteryear, yet we sat patiently on the sidelines, confident in our battle-tested approach. Divisional opponents made bold moves in an effort to unseat us, one even trying to beat us at our own game. For 254,880 minutes we have anxiously looked to this day. We have nibbled on the juicy nuggets of springtime the past two months. How would The Knee recover from a setback? Could illness truly fell a once-burly slugger? Would mediocrity (the utilitymen) or potential (Bartlett) emerge from the Scrum at Short? Could the Thunder from Down Under (Balfour) keep his head on straight and arm healthy? For one entire off-season we waited patiently. A legend, one who was with us from the very beginning, saw his journey come to an end. A great many changes occured this past winter, profoundly shaping the game we all know and love. Yet in the end, none of it truly matters. In the end, only one thing really counts: the game. Today, the cycle begins anew. Mistakes are forgotten. Optimism flows like wine at a springtime wedding. Wintery aches melt away like the snow on a balmy April afternoon. Baseball is back, and I can only say one thing: It's about time. Sorry about the lack of a new post yesterday folks. Things sort of piled up on me while I was away, and it's taken a couple of days to get them all sorted out. Today, I'm going to share with you a few of the pictures I took while at last Thursday's Twins vs. Pirates matchup at Hammond Stadium (a 5-4 Twins victory). It was (unfortunately) the only day of the trip we had to spend in Fort Myers, but it was still a great experience. Mike Herman, former St. Olaf baseball player and current Twins media/player relations manager, gave us an inside tour of the facilities before the game started and allowed us to watch most of the action from the press box (which was pretty cool). I'm no Art (who I saw with his camera by the dugout), but I think there are some pretty decent shots here. 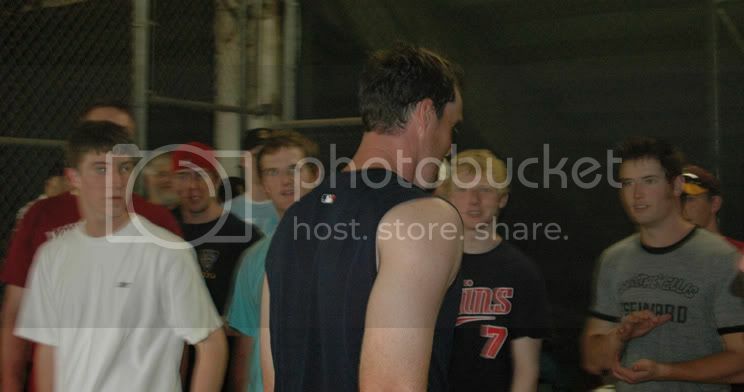 Joe Nathan walks by some starstruck St. Olaf baseball players before last Thursday's game. 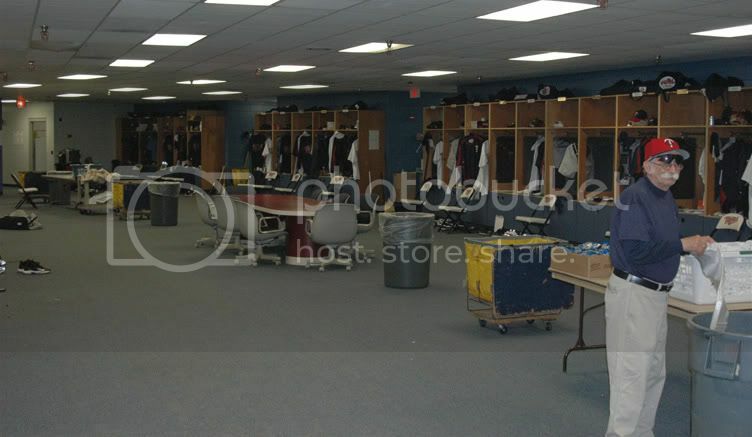 Wayne Hattaway does some work in the Twins clubhouse. Pretty nice, huh? 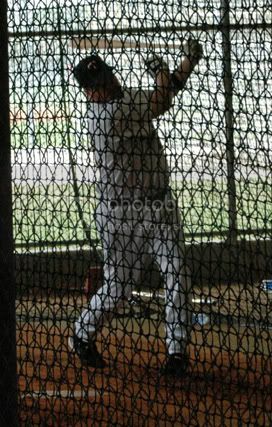 Matty LeCroy takes some last-minute swings in the under-stadium batting cage. Juan Rincon does some weightlifting in the training room. 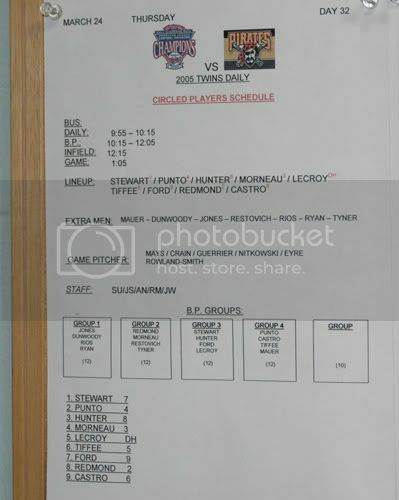 The official lineup card (posted in the clubhouse) from Thursday's game. 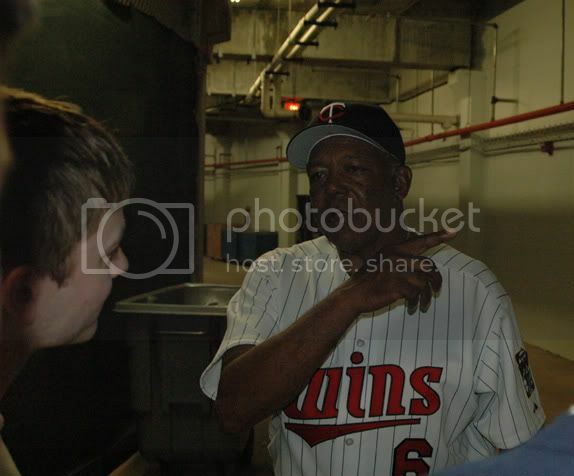 Tony Oliva, never one to shy away from a conversation, gives an Ole player some advice. Starting pitcher Joe Mays warms up in the bullpen. The rest of the available pitchers for the game sit in the bullpen. 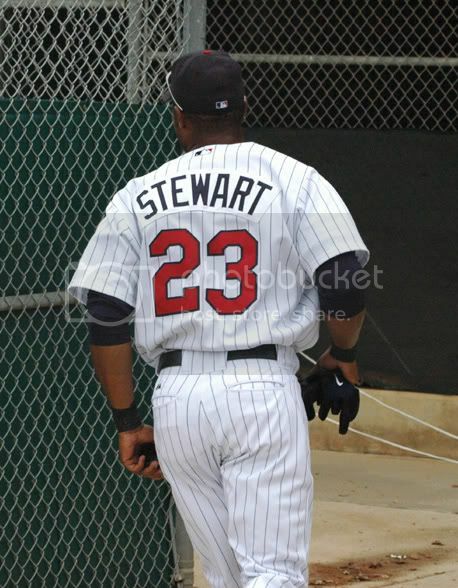 Shannon Stewart makes his way onto the field right before gametime. 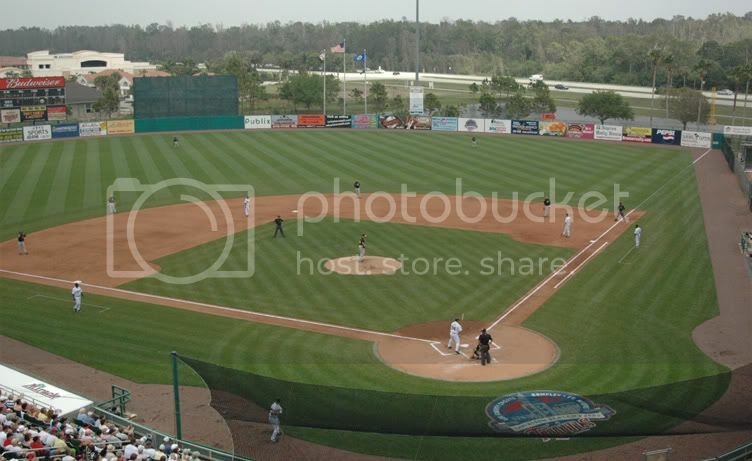 A wide view of Hammond Stadium. The view of the action from the press box. Dan Gladden and Herb Carneal as they broadcast the game on WCCO. Juan Castro makes contact during the later innings. Terry Tiffee actually scored on Castro's hit. Jesse Crain, one of my favorite Twins, gets warm in the bullpen. Wouldn't this sign look great in my dorm room? One Final Word: In case you hadn't heard, Micheal Restovich was claimed off waivers by the Tampa Bay Devil Rays yesterday. It's been a long six years for Resto in the Twins organization, and although I'm sad to see him go, I'm glad he'll finally get the chance to show what he can do in the bigs. I actually saw the Rochester native play back in high school back in 1998, and the 425 foot foul ball he hit at our local high school field in Northfield is actually the stuff of legend around here. Good luck, Resto. I wish you nothing but the best.